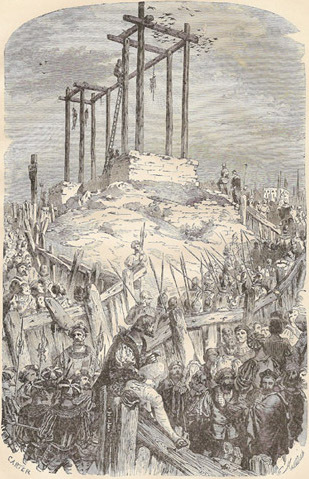 On this date* in 1527, Jacques de Beaune was hanged on the gallows of Montfaucon for peculation. Beaune (French Wikipedia entry) was an aged man well into his 70s or 80s, and had served four kings’ treasuries, rising to become Superintendent of Finance for Francis I. His slow-motion ruin began with France’s military involvement in Italy earlier that decade, in which capacity the French commander near Milan suffered a grievious reverse and had to abandon Lombardy. The ensuing investigation revealed this story to be true, but Beaune was obliged to retire from the court because of the Queen Mother’s fury at him. And that might have been that, but for the further French misadventures in Italy. In 1525, Francis himself contrived to be captured at the Battle of Pavia, elevating Louise of Savoy to regent in his absence. By the time the spendthrift king had been ransomed back, his treasury was nigh empty and Louise knew just the person to blame. Semblancay was tried by a handpicked favorite of the court, with the predictable result on a somewhat nebulous embezzlement/corruption thing; a jailhouse snitch once in the great lord’s employ gave evidence against him. The doomed man, perhaps untroubled to be relieved of the infirmities of his advanced age, was supposed to have been downright chill walking through Paris to his death, and he was met with respect by a citizenry that could hardly help sympathizing with this wizened but serene victim of the royal wrath. Lieutenant Maillart to be hanged at Montaucon. And it launched an ensuing, decade-long project of Francis’s, to squeeze wealthy financiers through the commission de la Tour Carree and thereby get in the good graces of the early modern bond markets unsettled by France’s 1520s fiscal faceplant. We noticed in a great Press from twenty to twenty-five huge Gallows-birds round a great Table [bourreau, punning bureau] covered with green Cloth, staring at each other, with their Hands as long as Crane’s Legs and their Nails two Feet long at least, — for they are forbidden ever to pare them, so that they become as crooked as Bills or Boat-hooks — and just at that time was brought in a great Bunch of Grapes which they gather in that Country, from the Vine called Extraordinaire, the Grapes from which often hang on Poles. 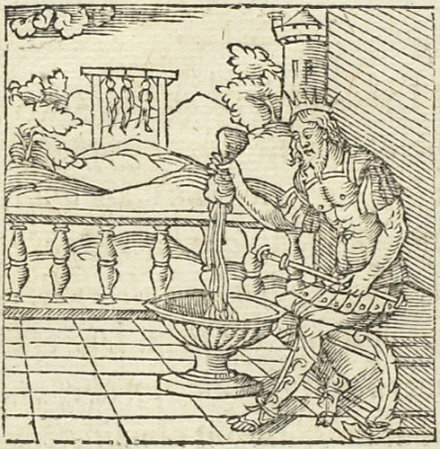 As soon as the Bunch was laid there, they put it under the Press, and there was not a Berry from which they did not squeeze Oil of Gold, insomuch that the poor Bunch was carried off so drained and stripped, that there was not a Drop of Juice or Liquor left. Most of those Tour Carree prosecutions didn’t result in executions — “merely” confiscations of lands and titles which could be re-sold, and sentences which could be commuted for a fine. R.J. Knecht, in The Rise and Fall of Renaissance France, 1483-1610, puts the king’s profit on such confiscations into the millions of livres. But to make those shakedowns seem a small price to pay, the threat of Semblancay’s example must have lurked in the background for targeted nobles. Also see emblem number LXXV. The Beaune name would scintillate to posterity through such illustrious descendants as Renaud de Beaune (French link), a notable archbishop; and, more salaciously, Escadron Volant all-star Charlotte de Beaune Semblançay, who seduced powerful nobles at Catherine de’ Medici’s behest. A lengthy French history of our day’s early modern moneybags can be perused here; when visiting Tours, you can revisit the days when he was in the chips by crashing at one of the many buildings he put, the Hotel de Beaune-Semblancay. * Sentence was pronounced on Friday, Aug. 9, but a stay granted until Monday, Aug. 12 for the condemned man to pursue his appeal to the king. Some sources give Aug. 9 as the execution date, and some Aug. 11; both of these appear to be incorrect. See David Graham in An Interregnum of the Sign: The Emblematic Age in France – Essays in Honour of Daniel S.Russell. ** There’s another (translated to English) meditation Marot wrote on Semblancay here, in the first-person voice of the hanged man. Marot was a friend of the eventually-executed French linguist and translator Etienne Dolet, and his own unorthodox opinions would eventually require him to flee the realm for his life. Tremblez, tremblez, larrons gros & petiz! Retirez vous, gens trop fins et subtilz! Qui d’attrapper estes tant ententifz. Sur vous surviegne tempeste & tonerre! Souvieigne vous de la mort Sant Blancey! † It happened yet again in September 1535, to Jean Poncher. Historically, proximity to the French crown’s revenues was also proximity to the gallows.